Luke Wright could have been a pharmacist if it hadn’t been for two monumental turning points. First, he remembered he was an artist. Second, he felt God calling him to something entirely unexpected.These days, Wright, 25, doesn’t wear a white lab coat to work, and unlike most recent college graduates, he doesn’t struggle to meet his boss’ demands. He simply rides his bike to his own little pottery studio in Winona Lake, Ind., and gets to work running his own business. 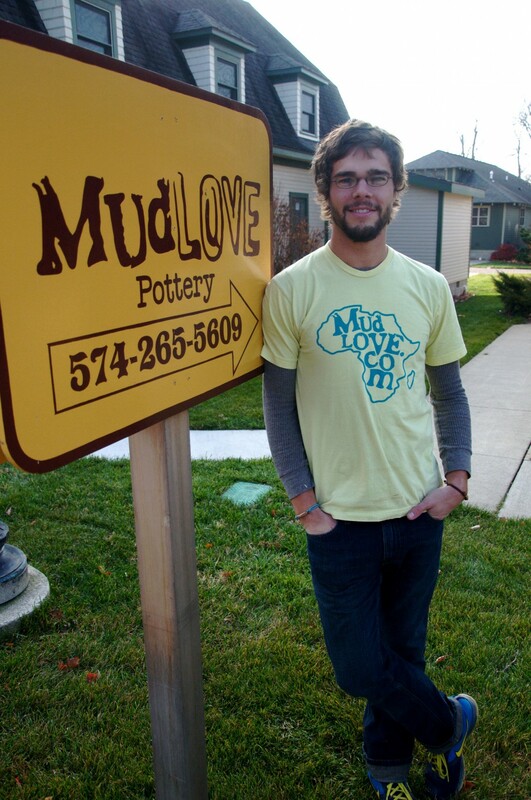 At 804-G Park Ave., home of Mudlove Pottery, Wright not only makes and sells his own artwork, but also he works to provide clean drinking water for villages in the Central African Republic. For every $5 a customer spends at Mudlove, the young entrepreneur donates $1 to the clean water effort. By Mudlove’s four-month birthday in February 2010, Wright was able to donate $162 dollars to supplying clean water in Africa. He does so through Integrated Community Development International (ICDI), an organization that drills and maintains wells in the Central African Republic (CAR). That $162, according to Wright, is enough to provide a year’s worth of clean water to 162 people for a year. And as business increases, Wright is able to donate more. In November 2010, he donated more than $1,300. His goal is to raise enough money to rehab an existing well in CAR at an average cost of $3,500 and he says during his first year of operation, he was able to fund nearly two rehabs. “It makes a nice short-term goal,” he says. Though Wright started his business in October 2009 (only a few months after graduating from Indiana Wesleyan University), he never would have imagined he’d be doing what he is today. He didn’t expect to be giving his money away, either. “I was on the way to work [construction] with my dad one morning and we were listening to Christian music and God just kind of spoke to me and told me that the business isn’t about me so much as it is about finding a way to serve Him. Through that epiphany I realized it needed to be about something more than just pottery, so it turned into a business that would help raise money for something,” he says. Wright acknowledges that he’s an entirely different person now than he was just a few years ago. And after four years at IWU and three changes in major, Wright graduated not only with a degree in ceramics, but with a newfound faith in Jesus Christ. 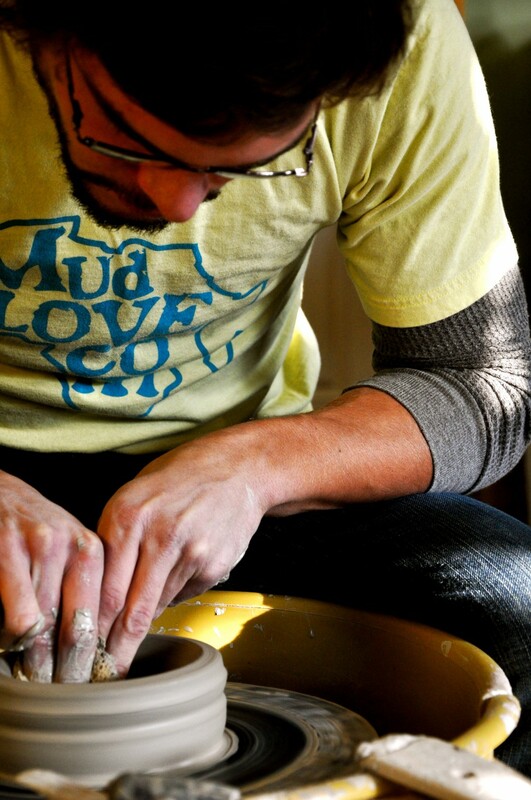 Now, Wright has found that his faith is essential to the whole Mudlove project. “I’ve just had to totally commit to God that He’ll provide. I mean there’s times where I’m thinking ‘I can’t give this money away because I need this money.’ I look at it and think ‘I could have used that.’ And it’s not like I look at it and I’m always like ‘I love giving.’ I just had to come to the point where I realized that the only reason I have what I have is because of God,” he admits. Wright says he’s definitely seen the way giving has affected his decisions. Adjusting his lifestyle has been a big part of running Mudlove the way he feels called to, but Wright says he has seen God bless it. Through all these changes, Wright is learning more about what it means to be grateful for God’s blessings. “The most obvious change in my routine is my awareness of tangible blessings in my life. Having clean water to drink and hot water to take a shower is not a right, it’s a blessing that has been given to me,” he wrote in his March 2009 newsletter. Beyond selling mugs and dishes to customers who wander into his shop, Wright considers himself fortunate to have received a lot of special orders from customers who appreciate his philanthropy and want to support the cause. He even found a way to bring Mudlove to church–he made more than 30 mugs for the members of New Horizon Community Church, a Grace Brethren congregation in Winona Lake (Scott Barger, pastor). He’s also begun making Lovebands, a long ceramic bead with motivational words such as love, dream, hope, passion, and grace. Other words that reflect an individual’s interest are also available, such as bike, run, or rock n’ roll. They come with a brown adjustable band and can be worn as a wristband or necklace. “They are perfect for youth groups or conferences,” he says, nothing that he’ll make any type of custom bead and bulk discounts are available. Wright has found other ways to get the community involved–from pottery lessons to art projects in the local elementary schools. This businessman-artist has helped the community not only to donate, but to get their hands muddy, too. In May 2010, he was invited to participate in the 5th Grade Africa Project in each of the eight elementary schools in Warsaw, Ind. He visited each fifth grade art classroom, teaching the students not only how to make pottery, but also, about the importance of helping others. The students each made clay people, which were sold in the Village at Winona, where his studio is located, for $5 each. One hundred percent of the income from those sales went to ICDI. Liane Schmersahl is a senior at Grace College, Winona Lake, Ind., where she is majoring in English and Journalism. A native of Frederick, Md., she attends/is a member of Grace Community Church, a Grace Brethren church in Frederick. Learn more about Mudlove Pottery and its efforts to fund clean water for Africa at mudlove.com or on Mudlove Pottery’s Facebook page.